The base year considered for company profiles is 2015. Whenever information was unavailable for the base year, the prior year has been considered. This research study involved the use of extensive secondary sources, directories, and databases, such as Hoover’s, Bloomberg Businessweek, Factiva, and OneSource, to identify and collect information useful for a technical, market-oriented, and commercial study of the global small gas engines market. Primary sources are mainly industry experts from core and related industries, preferred suppliers, manufacturers, distributors, service providers, technology developers, standard and certification organizations of companies, and organizations related to all the segments of the industry’s value chain. The points given below explain the research methodology. 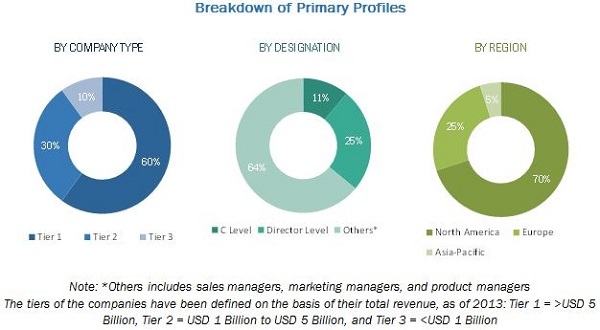 The figure below shows the breakdown of the primary respondents on the basis of company, designation, and region, conducted during the research study. 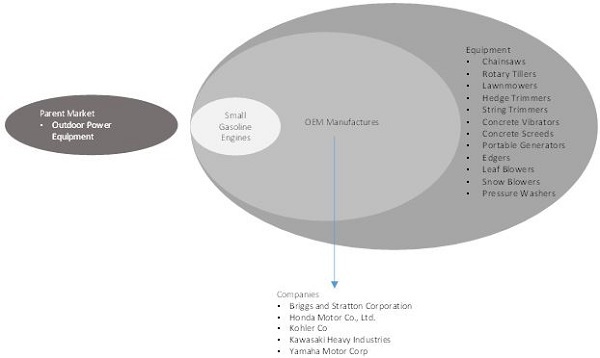 The ecosystem of the small gas engines market begins with small gas engines manufacturers. These engines are then distributed to outdoor powered equipment companies and installed in equipment such as lawnmowers, chainsaws, string trimmers, hedge trimmers, snow blowers, portable generators, concrete vibrators, concrete screeds, edgers, and pressure washers. Small gas engines are used in various outdoor power equipment like chainsaws, rotary tillers, hedge trimmers, string trimmers, concrete vibrators, concrete screeds, lawnmowers, leaf blowers, snow blowers, portable generators, pressure washers, and edgers, among others. There is high demand for lawnmowers, which is one of the factors that is likely to drive the growth of the small gas engines market. The residential and commercial construction market accounts for a majority of lawn mower equipment sales. Equipment sales are primarily driven by increasing adoption of landscaping in various regions. The report segments the small gas engines market by engine displacement, end-use, and region. In the engine displacement segment, the 101–400cc engines lead the small gas engines market. The 101–400cc engines are mainly used in lawnmowers, snow blowers, portable generators, and pressure washers. The increase in demand for outdoor powered equipment is the prime reason for the growth of this segment. However, eco-friendly alternatives, such as electric, battery, and hybrid-powered engines, are a threat to the small gas engines market. Further, equipment providers can opt for backward integration and manufacture in-house engines to power their equipment which also poses as a threat to the manufacturers of small gas engines. In the end-use segment, the gardening segment is the most prominent. The market for small gas engines is likely to grow due the rising number of landscaping firms. Lawn renovation, lawn care, and snow removal are the specialty services that are most in demand in commercial and residential establishments. This leads to an increase in demand for outdoor powered equipment required for these activities, which further increases the demand for small gas engines. The report also segments the small gas engines market into four regions, namely, North America, Asia-Pacific, Europe, and the Rest of the World. The North American region is expected to dominate the small gas engines market and is also expected to be the fastest growing during the forecast period. 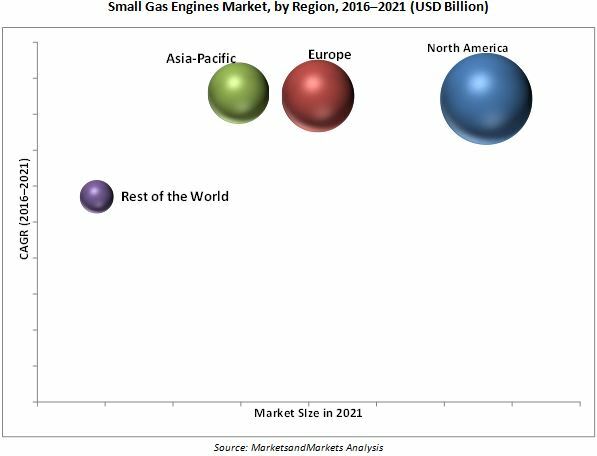 The small gas engines market is mainly driven by the rise of the construction industry, especially in North America, Europe, and Asia-Pacific. The U.S. will be the fastest growing market for small gas engines with growing investments in the construction industry and the rental of outdoor powered equipment. The major restraint for the industry is the price of small gas engines. Consumers are buying cheap equipment from merchandisers or retailers at low prices. These merchandisers or retailers are pushing Chinese products that are available at lower prices, but are of low quality. This price war has pushed manufacturers to a point where they have lost the ability to sell their engines at a premium. The small gas engines market is dominated by global players such as Briggs & Stratton Corporation (U.S.), Kohler Co. (U.S.), Honda Motor Co., Ltd. (Japan), Yamaha Motor Corp. (Japan), and Kawasaki Heavy Industries (Japan). The key strategies adopted by various companies include contracts & agreements, new product launches, expansions, mergers & acquisitions, and joint ventures. Contracts & agreements was the most commonly used strategy from 2014 to 2016, comprising of 57% of all developments, followed by new product launches, which consisted of 24% of all developments, during the same period. 11.12 Fuzhou Launtop M&E Co., Ltd.
11.14 Maruyama Mfg. Co., Inc.
11.15 Fujian Jinjiang Sanli Engine Co., Ltd.
11.16 Mitsubishi Heavy Industries Engine & Turbocharger, Ltd.
11.17 Chongqing Rato Technology Co., Ltd.
11.18 Hitachi Koki Co., Ltd.
11.19 Zhejiang Wanhao Machine Science and Technology Co., Ltd.
11.20 Jiangsu Excalibur Power Machinery Co., Ltd.
11.22 Chongqing Winyou Power Co., Ltd.
11.23 Taizhou Nimbus Machinery Co., Ltd.